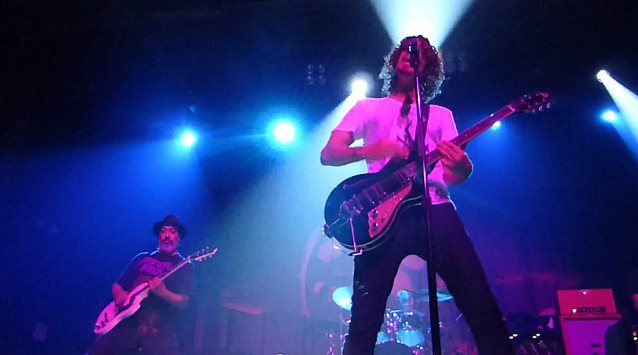 According to Seahawks.com, reunited grunge legends SOUNDGARDEN will help celebrate the start of the NFL season by performing on Thursday, September 4 outside Seattle's CenturyLink Field as part of the 2014 NFL Kickoff presented by XBOX. Also scheduled to appear is the Grammy Award-winning singer, songwriter, rapper, and record producer Pharrell Williams. Doors to CenturyLink Field's North Plaza open at 2:30 p.m. PT, with the performance to take place prior to the matchup between the Seahawks and Packers. SOUNDGARDEN will kick off the free event with simulcast coverage of the 60-minute pregame show airing from 4:30 p.m. to 5:30 p.m. PT on NBC and NFL network. SOUNDGARDEN's co-headlining summer trek with NINE INCH NAILS kicked off on July 19 in Las Vegas, finishing up on August 25 in Los Angeles. The 20th-anniversary reissue of SOUNDGARDEN's breakthrough 1994 album, "Superunknown", sold 5,700 copies in the United States in its first week of release to land at position No. 51 on The Billboard 200 chart. The 20th-anniversary reissue of "Superunknown" was made available in two deluxe versions. The Deluxe Edition is a 2-CD package featuring the remastered album along with disc two consisting of demos, rehearsals, B-sides and more.